Projects consist of 2 Glass panels, Silk Screened, 2 tone gilding Chicago style, in-layed Abalone & Jewels, Mica Powders & Glitters. Work on 2 separate panels, while waiting for the glue to chip the glass, we will roll into water gilding. PART 1: Sand Blasted & Glue Chipped Glass, Prep, Blasting Mask, Chemicals & Drying Techniques. PART 2: Water Gilding Reverse Glass, Prep, sizing, backing up, detail clean-up, & touch-ups. PART 3: Silk Screen both panels with back-up and detailed. 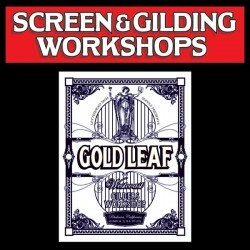 Learn the tools & techniques used in post gilding clean up, touch up and repairing a gild after backup up. PART 4: Surface Gilding with oil based size, understanding gold size tack & setup. Candy Apple Gold Leaf techniques by Ron Percell. PART 5: Applying Abalone, Mother of pearl & Mica Powders. Open discussions throughout afternoon and time to work on panels.